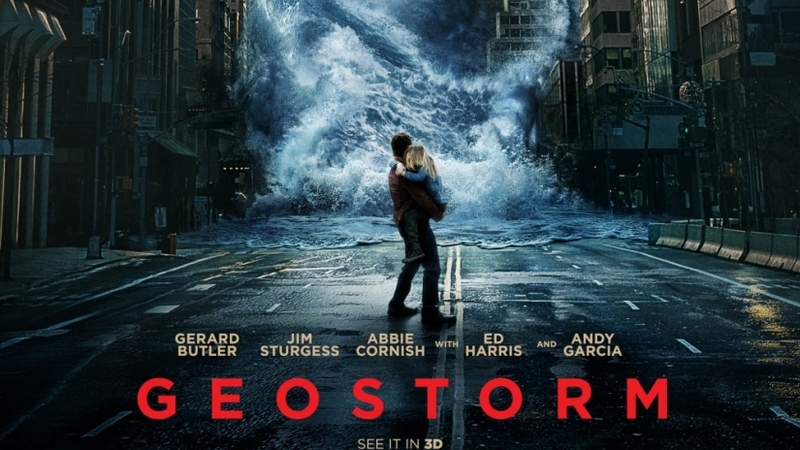 Geostorm takes place in a near future where the world was recently ravaged by climate change induced superstorms. At the last minute before permanent global catastrophe, the world banded together to build a system of satellites that now control the weather, calling it ‘Dutch Boy.’ Now ’Dutch Boy’ is going haywire and also threatens to destroy the planet. Gerard Butler is completely miscast as the genius scientist who built the system. Butler bucked authority and was then promptly fired by his own brother, (Jim Sturgess) a slimy bureaucrat working for the state department. Oh god, now it’s personal. But of course, Gerard Butler is the only person who can save the world. Now it's up to these two brothers, who hate each other for contrived purposes, to work together to save the world. The film is more monitory. Like this. In a movie that’s about superstorms destroying the world, there's actually very little of that happening. This is because most of the plot is not actually about escaping the impending cataclysm, but rather about finding out who is behind it all. Most of the film consists of the protagonists tracking down the culprit, grumbling into monitors about machinery not working, then trying to fix it, stop it, or shut it down. When you actually do see the film’s superstorms, or any action at all for that matter, it's rendered in amazingly bad CGI. Remember that idiotic car chase scene from the movie 2012? There are two of those and they're are equally stupid and equally unbelievable, and that’s as close to any excitement as you are gonna get from this movie. There’s one spacewalk sequence where things go predictably awry, causing Gerard Butler’s character to bounce around the movie screen like a pinball. Somehow he manages to survive this ordeal without so much as a scratch. The production team that filmed Gravity would be ashamed to be associated with this movie. This movie is a joke and a bad one at that. I kid you not, one guy fell asleep in the movie theater a couple seats down from me. That’s how goddamn mind-numbing this movie is. I can’t even remember the character’s names but they are hardly even worth mentioning. Besides being uninteresting, most of the characters aren’t ever in any real danger so there’s hardly any tension to the movie. Never in the movie does it seem like anything is in true peril, and likewise, all the characters barely emote as they go about saving the world like they’re checking off items on a shopping list. The few times we do get to see a disaster event on a wide scale, it only affects background extras whom the audience hasn’t been introduced to. The movie’s ending is so smarmily saccharine I almost rolled my eyes out of my skull, trying to reconcile brief scenes of global genocide with the film’s “One Planet, One Future, One People” end quote. 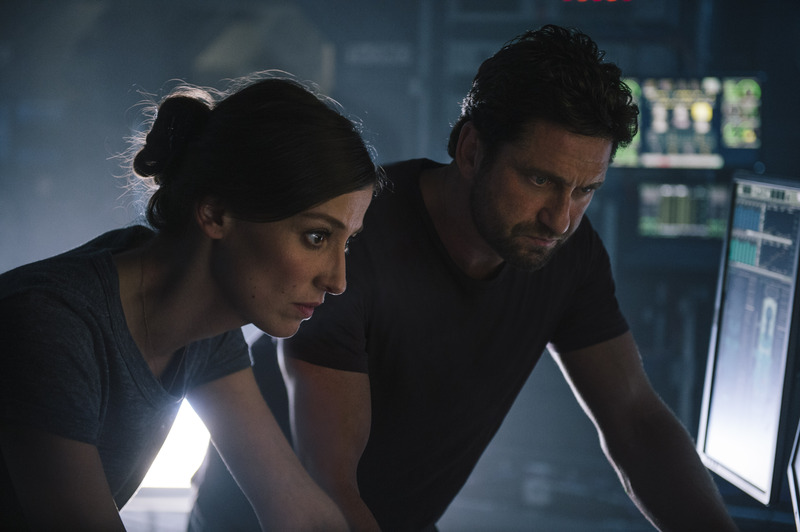 Geostorm is stupid, but even more damning, it's dull. How the director managed to take the film’s concept of a world-destroying superstorm and make it boring is mystifying to me but, by providence, Dean Devlin and Warner Brothers have succeeded at this task. I should have guessed since Dean Devlin helped write one of the worst sequels ever made. If you must see this movie, prepare to be bored to tears by a forced melodrama, boring scenes of people yelling into monitors, and terrible CGI. Geostorm is retread, derivative garbage that you’ve already seen done better before numerous times.